Why choose linear drainage over traditional drainage? Linear drainage is a cutting-edge drainage solution that delivers level-plane (i.e. 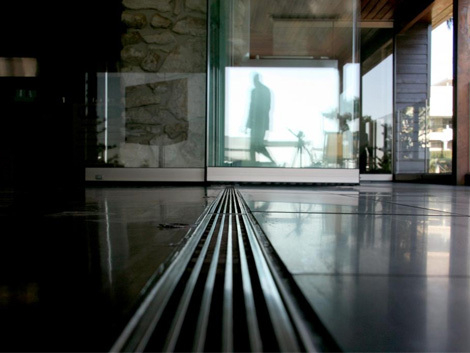 flush with the ground surface), ‘zero stepdown’ drainage for both indoor and outdoor applications. Specially designed to eliminate the access and mobility constraints of traditional centralised drainage systems, lineal drainage solutions have evolved as a stunning architectural statement – the quintessence of today’s vaunted open-plan designs. Traditional drainage requires complex 4-way grading to maintain adequate drainage flow and water egression. Uniquely, linear drainage solutions are designed to work with only a single gradient fall, eliminating a dangerous trip hazard and offering easy installation possibilities. Traditional drainage often suffers ponding (or undrained water pools) which pose a serious slip hazard, and offers fertile breeding ground for mould and pests. 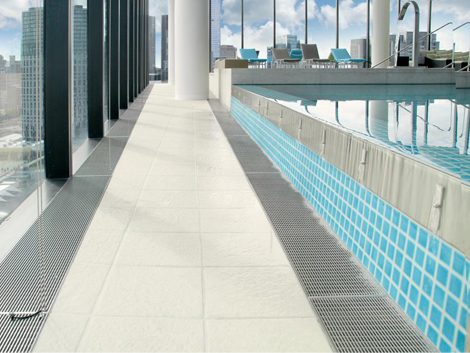 By extending the area of drainage and accommodating for large-format tiles, lineal drainage solutions promote consistent drainage flow and a reduced incidence of ponding. Centralised traps are easily clogged (e.g. from hair, bandages, clothes, towels, etc. ), the extended length of the linear waste channel resists both potential blockage and trapped water pools. Shower hobs remain an essential provision for centralised drainage solutions: without them, water can easily breach the drainage area and seep into internal living spaces. However, the elevated stepdown of the hob presents a major accessibility barrier. Level-plane linear drainage, which sits flush with the floor surface, provides not only a natural water barrier (offering excellent drainage possibilities in and around the drainage area), but removes the necessity of the raised hob, allowing seamless and self-sufficient access for all residents (particularly for those using wheelchairs, walkers and frames). Specifically designed to eliminate traditional barriers (e.g. doors, hobs, water protective walls/barriers) and expand the area of drainage and with less need for a carer to assist entry, residents are offered more personal access into the shower space. For staff, this open design aids with cleaning and offers greater accessibility for carers when required. As a modular system, linear drainage can be tailored for any environment (inside or out), requiring little to no modification of the built area. This significantly reduces construction time and costs. With the addition of vinyl clamp (providing a screw down flange to mechanically clamp the vinyl beneath), linear drainage also offers seamless integration into vinyl floor surfaces (common throughout today’s care settings). 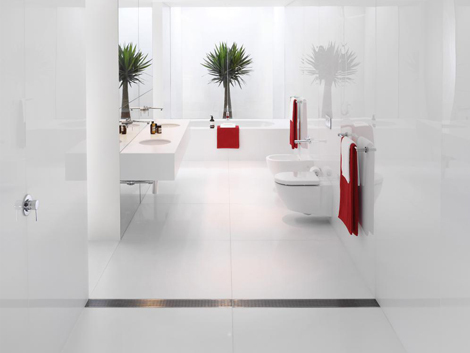 A linear solution is a striking visual statement: a chic and ultra-modern look that can enhance the visual appeal of any drainage space. As the creator and proud pioneer of this unique drainage system, Stormtech is recognised globally as an industry leader in design, consultation and manufacture of lineal drainage. Stormtech is committed to delivering a cost-effective drainage solution that makes no compromise on quality. Stormtech’s ingenious modular design translates to rapid and cost-efficient installation possibilities for today’s projects. Dedicated to quality tailored service, Stromtech offers custom design options on all fit-outs as part of regular service.